Inspired by geometric shapes and stained glass, this watercolor print is a vibrant representation of Aspen. "Roaring Fork Valley," was inspired by a birthday excursion to frosty Aspen. To celebrate her birthday, the artist, Renée Leone, could think of nothing she wanted more than to perch herself along the trails and capture their beauty. 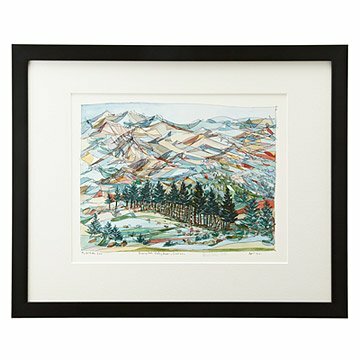 my sis is an artist and i've been looking for affordable and unique, quality prints for her vacay home in the mountains. she liked it so much, she is thinking about purchasing 2 more from this artist for a large wall that needs art. I see this print (which I had framed myself) every morning as I wake up and it lights up my day with the detail and the imagination used to create it. I love mountains and nature. The review on framing was not the best, so I did get it framed to my specs with glass and a narrow dark green metal frame that matched the colors depicted. The catalog picture had "Aspen" Colorado. My picture only says "Colorado". Luckily my husband recognized the location. Otherwise, we love the picture; brings back great memories of us skiing each Winter until my knee replacement cut my time on the slopes to a halt. I love her Red Lodge pic as well. Am saving to get that as well. Really like her work. The print was better than expected. The colors are beautiful and richer than what I saw online. I am interested in buying others. The print itself is beautiful as is the one "Elation" my husband purchased for me from a different artist. However, the quality of the frames and are not covered in glass, but plastic and for the price, we found both to be cheaply framed. Delivery was poor, taking up to 3 weeks to receive from artist to framer in Oregon and then to recipients. Got there Christmas eve, almost 3 weeks after purchase. Mine was delayed and missed my birthday (we live in California by the way)...so if you need a print in a hurry don't order from Uncommon Goods. All other purchases we have made were excellent service and delivery. Loved the first piece I purchased so much that I decided to buy three and hang them on a problem wall in my living room. Beautiful! Ms Leone's impressionistic sketches evoke all the things I love about the west and take me back to places I've visited. I smile whenever I walk past that wall now. Very original and picturesque. Just abstract enough to distinguish itself. Nicely done!